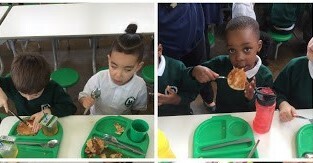 There were lots of happy faces today tucking into their delicious pancake day lunch. The sausages, fish fingers and jacket potato proved popular and the pancakes were quickly eaten up. In class we learnt about why we have a day called pancake day when we don`t have a special day for other types of food. The children are now really looking forward to their special World Book day menu. Just to let parents know we have some very unhappy children. West Ham failed to turn up today! This is particularly annoying as they had already cancelled last week and they did not inform us they were unable to attend. Apologies to all parents/carers who made a special effort to send in claret/blue PE kits. I have e-mailed them to express my concern and want parents to know that, despite the fact I am a Chelsea supporter, I share the children's disappointment. Here are some maths challenges for this half term. Please encourage your child to solve them at home and bring in their outcomes to school to share. Each half term we will be setting our pupils a challenge related to their learning, this is in line with the rest of the school. We believe that it is important for us to provide guidance for parents on how their children's learning can be extended at home. The learning challenge will include either a nursery rhyme, illustration or a piece of music. Please talk to your child about the challenge and help them to engage in their learning. The children can choose how they present their learning challenge outcomes to their teacher or class however the table below details some ideas for the learning challenge. The learning challenge replaces traditional ‘homework’ and runs alongside daily reading with your child. Is it expected that you read with your child every day. Author: Find out about Julia Donaldson. Use books and computer to research Julia Donaldson. What does she do? What books has she written? Find out about her life. 4. To learn the word 'Author' and what it means. PM Nursery children had the chance to go into the hall last week to learn all about dinosaurs. As well as seeing a baby dinosaur and hearing it roar, they also got to witness a life size T-Rex! What a fun way to spend the afternoon! Parents are invited to come into Nursery for a workshop explaining how we teach your children phonics (letters) and how best you can help them at home. Please come to the session your child attends. There will be practical advise on how best you can help your child achieve their full potential in Literacy. If you have younger children to look after they are welcome but please be mindful that you may have to leave the room if they are making too much noise. We value your participation in these events and hope to see you all there! A big well done to Ronnie Thomas in year 5. Last week Ronnie received his yellow belt at the VM Kickboxing and MMA Academy. His continued hard work and effort has enabled him to achieve this goal and we are all sure he will continue to make progress through his belts. A big well done from everyone at Mead. We had a super week back learning all about dinosaurs and our dinosaur day was a huge success. We will be continuing with our dinosaur theme this week so if your child has anything at home connected to dinosaurs we would be delighted for them to bring in dinosaur themed things to show. Remember Thursday is world book day so the children may come to school dressed as a book character and we will have a day celebrating the wonder of books and stories. We will be working on the theme of estimation through our focus maths times. Estimation is a skill for life learning to work out the approximate number by looking so we will be teaching the children to make an estimate based on what they have seen and know. Estimates how many objects they can see and checks by counting them. Builds stories around toys, e.g. farm animals needing rescue from an armchair 'cliff'. Understands that they can use lines to enclose a space, and then begin to use these shapes to represent objects. 3. Watch the person/dinosaur in action. Well done to Barbados class for winning this week`s Remarkable Readers award. Who will be next? On Wednesday 8th March between 8.30 and 9.00 we would like to invite you to stay and Read with your child. Reading is so important but we know how busy life is so this is an opportunity to hear your child read/share a story with your child in school. A dinosaur came to Mead! On Thursday Reception were busy digging for fossils. We became palaeontologists for the morning and using our brushes we carefully wiped away the sand to uncover our fossils; we discovered a triceratops horn, a pterodactyl fossil which we found had a wing span of 1.5m, a dinosaur claw and tooth and also some other sea creatures which existed 65 million years ago. The children discovered that dinosaurs could be herbivores, omnivores or carnivores and that they became extinct because of a meteor which fell to earth. Did you know? The biggest and heaviest dinosaur was an Argentinosaurus. In the afternoon the children eagerly awaited their surprise and they were not disappointed when they met ‘Chewy’ the baby dinosaur and then Millie the Tyrannosaurus Rex. They were all extremely brave and even went and stroked Millie before posing for a picture with her! It was a great introduction to our topic this term, bringing our learning to life. We never realised how many dinosaur experts we had in Reception! This week in Year 4 the children have been looking at the play script called The Fly and The Fool. The children have focused on character descriptions, setting and stage directions. Throughout the week Chloe Gain, Nura Aboubakari and Alecia Mmor have produced some fantastic pieces of work in preparation for producing their own play script. We are delighted to provide you with the Year 4 Learning Challenge for this half of the Spring Term. This learning challenge gives the children the chance to look at an artist, musician, person and a poet relating to what they are learning about in school. It is entirely up to your child whether they select the poem, significant person, music or painting, or a combination of all 4. They can also select the activities that they want to attempt, though we would encourage them to be ambitious and to deepen their learning as much as possible. Although the Learning Challenge is entirely optional, and is in addition to the daily expectation of 15 minutes’ reading, 15 minutes’ times tables rehearsal and 15 minutes’ spellings practice, we have found that a large proportion of children have voluntarily taken up the challenge and have gained a great deal from it. We would therefore greatly appreciate your encouragement to participate. The children will receive a special Learning Challenge certificate at the end of the half term on completion of a project that shows a significant level of effort and challenge undertaken. Should you have any problems regarding this, or any other issue, please do not hesitate to contact us. We would like to take this opportunity to thank you for your continued support, and look forward to working with you this academic year. Research the life of the composer. Produce a piece of art/collage based on how the music makes you feel. Year 3 WOW day challenge! Sculptor Visit - Castle on the Hill! A trip to the Docklands.